Basel, November 27, 2018 Today, the Novartis Foundation and partners announced the results of an innovative approach to hypertension management in Ghana. 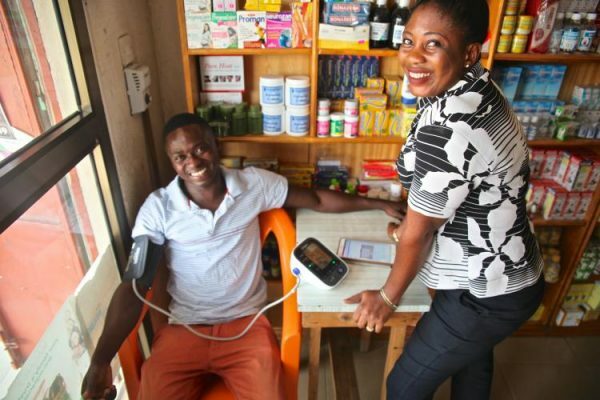 The community-based hypertension improvement project (ComHIP) tested a new model to detect, diagnose and treat hypertension earlier by placing screening points in local shops and businesses and strengthening existing facilities. This captured patients beyond the reach of traditional health facilities. Digital health tools connected the new screening points with community health workers and physicians; supported nurses’ decision-making; and empowered patients to self-manage their condition through messages sent to their mobile phones. The success of the three-year ComHIP pilot led the Ghanaian government to integrate the project training curriculum and treatment guidelines into Ghana’s national policy and commit to scaling-up the program to additional regions. The Novartis Foundation is a philanthropic organization which strives to have sustainable impact on the health of low-income communities through a combination of programmatic work, health outcomes research, and its translation into policy to tackle global health challenges. We work together with local and global partners to catalyze sustainable healthcare models to improve access and health outcomes, and to accelerate efforts to eliminate leprosy and malaria by focusing on interventions that aim to interrupt transmission. Everything we do is grounded in evidence and innovation, and our work is a continuous cycle of evaluation, adaptation and application. In 2017, the operational budget for the Foundation was CHF 15 million and our programs reached 7 million people.